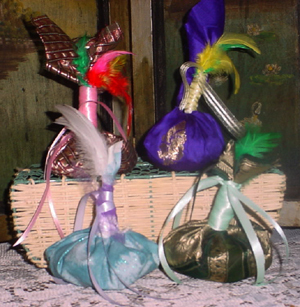 Hand crafted with special mixtures of herbs, power objects and bits of sacred offerings to the Loa, these old type fetish "Wanga" dolls unite the power of gris-gris and of voodoo dolls. They are some of the oldest types of voodoo dolls to come from Africa. One of our good clients who is also a Voodoo Priest is responsible for calling them our Wonderful Wangas, he said:" Thank you for your wonderful wanga.....maybe you should call them that, Wonderful Wangas! I have already raised half the money I need for our ceremony." Why not try one for yourself today and see how its subtle energy can influence a more positive path in your life. Each Wanga doll comes with complete instructions as to its placement and use for maximum success day after day. Due to a ruling by the United States Postal Service, and in accordance with all applicable Local, State, & Federal Laws, please be advised that Reverend Severina can make no claims of any supernatural or therapeutic effects of any of the items, either offered or listed, in this website.All services made available to the public through the New Orleans Voodoo Crossroads website or via telephone, or in person, are provided by Reverend Severina. These services are offered in a strictly professional & ethical manner.None of the owners(Reverend Severina, web designer or the web host), the subscribers, nor the affiliates of the same, will in any way be held responsible, either directly or indirectly, for any information provided, its use, lack of use, or for services rendered.No results can be guaranteed as your energies activate our products at varied levels. We only guarantee the care with which they are prepared for you. Caution: None of these items are suitable for children of any age. New OrleansVoodoo Crossroads, La Sirena Botanica L.L.C. : all products therein and images, designs, contents, descriptions, texts and tradenames are the exclusive property of NOVC / La Sirena Botanica L.L.C. Copyright 1991-2011 Severina Singh and/or NOVC L.L.C. and may not be reproduced without permission. All Rights Reserved.